Work on a cruise ship! Seriously. Who doesn’t want to live that kind of dream? Before I show you how to get into this incredible industry, let me quickly introduce ourselves. In the end, we’ve each traveled to 6 continents while earning more money than we ever thought possible at this point in our lives…and we have nothing but ‘ship life’ to thank! When it comes to ‘ship life’, Liz and I (as well as practically every other crew member you’ll talk to) both agree that our experiences exceeded all of our wildest hopes and expectations. If you ever meet us personally, you’ll see that we pretty much don’t stop talking about how lucky we’ve been to have discovered the life-changing opportunity that is ‘ship life’. MONEY and SAVINGS! 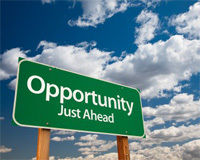 – You can expect to earn anywhere from $1500 to over $5000 USD per month, depending on position. More importantly, you’ll have almost ZERO expenses – room, meals, even medical coverage are provided for free. This allows you to save up to 90% of every paycheck. Where else can you save $10,000 – $20,000+ in six months? AMAZING SOCIAL LIFE – Sure, you may work between 40-60 hours per week (over 7 days), but you’ll have plenty of free time to live it up as well. You’ll have access to crew bars, crew lounges, dining areas, hot tubs, swimming pools, a crew gym and even a crew-only sunbathing deck, not to mention endless crew parties and theme nights! SPECIAL PRIVILEGES – Depending on your position, you can be allowed to socialize in the passenger bars, night clubs, lounges and theaters when you’re not working. Get all dressed up, take in a Broadway-style show, listen to live bands and dine in the five-star passenger restaurants…not a bad way to spend your free time! INTERNATIONAL FRIENDSHIPS – Working closely with hundreds of other crew members from around the world guarantees you’ll form long-lasting friendships with awesome people. You’ll learn about their cultures, celebrate their festivals (watch out for the Filipino New Year!) and enjoy a social life like you’ve never imagined. When you’re on vacation, you’ll be visiting some of these new friends as well! LIFE-CHANGING OPPORTUNITIES – Working on board a cruise ship is more than a job, it’s a valuable path to future opportunities. You’ll be able to do a ton of global networking with other crew members, with locals in every port and with the passengers. And you never know where your conversations will lead! Through networking on board, I’ve been offered a job in Greece, a free vacation to Costa Rica and a business partnership on the stunning Caribbean island of Barbados. 2-4 MONTHS OF VACATION! 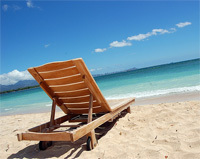 – What other job gives you up to 4 months of vacation per year? Yes, that’s right, up to 4 months per year! Think about all of that time off that you’ll be able to spend any way and anywhere you wish. The cruise line will even pay for your flight home. In the end, you’ll actually be working less and saving more money than if you were working on land! If you’re fully happy with your current lifestyle, maybe ship life isn’t for you. Once you walk up the gangway of your first ship, your life will never be the same. 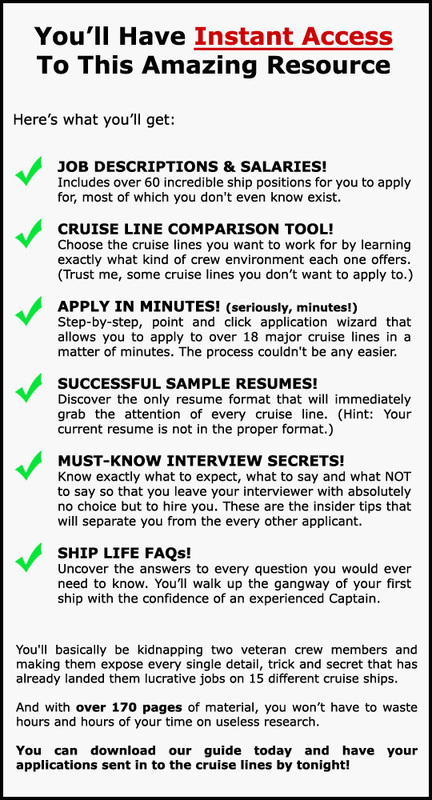 Of course, there are “Cruise Agencies” floating around that make some pretty wild claims, such as guaranteeing they’ll get you a cruise ship job within a few weeks. Of course, all you need to do is pay them a ridiculous amount of money first. And unfortunately, the sad fact is that once you part with your money, these agencies often do very little to help you at all. I once paid $250 to an online cruise agency. Sure, my gut told me not to but I wanted to work on a ship so much that I fell for the scam. This agency promised me a job within three months. As you might imagine, three months passed and not a single cruise line had even contacted me. And of course, the ‘agency’ never replied to any of my frustrated emails. Liz also used a cruise ship recruitment agency the first time around and the agency actually lied to her about the salary that she would be earning. When she arrived on board the ship to start her first contract, it was too late and she had to settle for 50% of what the agency had promised. These agencies receive commissions from the cruise lines for every crew member they hire and so they often tell applicants whatever it takes to get them to sign up. Forget about unofficial cruise ship recruitment agencies. Forget about paying for access to ‘private’ cruise ship job databases that don’t really exist. Forget about paying someone who claims to send your resume to 300+ cruise lines. There is no reason for you to waste any time or money on that stuff. All you need to work on a cruise ship is some insider information about how things really work and what will make you stand out. Only then will you be in a position to get hired. And it doesn’t get any easier than having experienced crew members guide you step-by-step through that process. For a long time, friends and friends of friends would ask us to help them find work on a cruise ship. After all, once they heard our ship life stories, they wanted to experience the same. Liz and I would email back these long replies, full of detailed, step-by-step instructions, job descriptions and specific advice. And…it worked. People were being hired by every major cruise line out there, and in a range of positions. It was awesome! 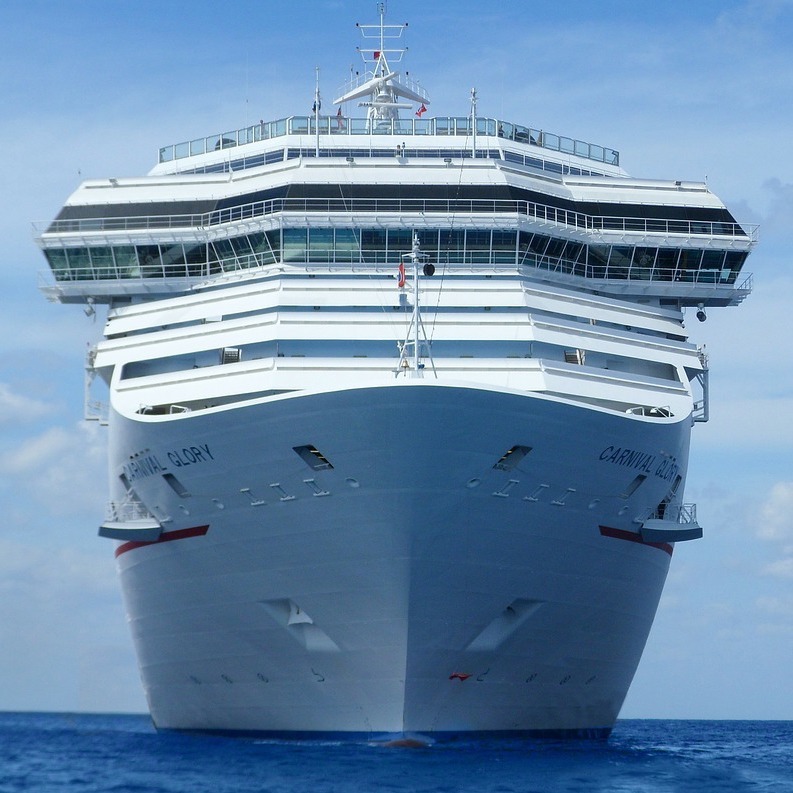 Then recently, it occurred to us that instead of writing email after email, we could take all of our insider information and knowledge and create a cruise ship employment guide. This guide would instantly benefit anyone who reads it. After all, our goal is to help as many people as possible enjoy the same benefits of ship life that we’ve enjoyed and such a guide was clearly the answer. We worked extremely hard for several months to put this material together, and we now spend a lot of time updating it every month as well. Remember, we’re not an agency, we don’t make false promises and we don’t mess around. All you need to know are the honest facts, nothing else. That’s exactly what you’re about to get. *By the way, the information in this guide WORKS FOR EVERYONE, no matter where you’re from or what country you live in! Yes, we do charge for the guide because we work hard to ensure it’s always the best resource possible. 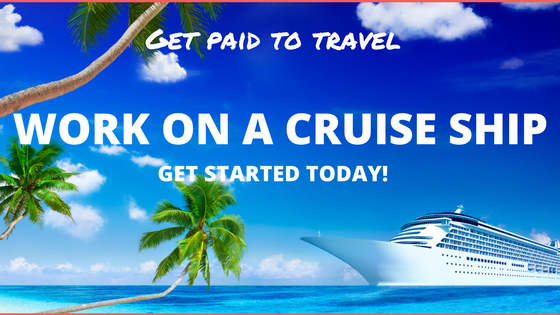 That’s all you’ll ever need to pay in order to land a job that will allow you to save $1,500, $3,000 or even more per month on board a cruise ship! Without a doubt, it’s going to be one of the smartest investments you’ll ever make. When that first paycheck comes in, I guarantee you’ll laugh at how little you had to spend for a job that allows you to save so much. Instant Access: As soon as your order is placed, you’ll receive a link via email that leads directly to our secure download page. You’ll then have instant access to all of the material. You read that correctly. 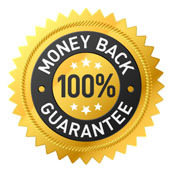 We offer a full 60-day money-back guarantee on every order. We’re so confident that this material will exceed your expectations that we want you to try it, without any risk whatsoever. If you don’t think the information will help you find work on a cruise ship, you have a full 60 days to ask for a refund. Just send us a quick email and we’ll refund the entire amount without any questions asked. This is more than a typical guarantee, this is our personal promise. When you order our guide, you can contact us directly with all your questions along the way. You’ll receive our direct email address and we’ll be there for you during every step of the application and hiring process. 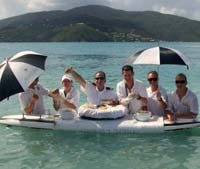 We’ll do our very best to help get you on board a cruise ship as soon as possible. P.S. Once you start work on a cruise ship, please send us an email and tell us all about your experiences with ship life. We’d love to know what ship you end up on and what part of the world you’re exploring! "Working on cruise ships was the perfect opportunity for me to see so much of the world and make friends with so many people from different countries. Every time I received my paycheck, I couldn't believe I was getting paid to do this! This was definitely one of the best experiences of my life so far." 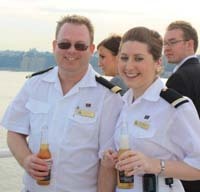 "Without a doubt, my time on board ships has been the most memorable period of my life. There's nothing like waking up in a new country every morning!" "Sometimes I think of working on land, but I'm not ready to give up the money, the travel and the friends just yet!" "I never thought I'd end up working on board cruise ships but now I feel lucky to have this opportunity. My vacation just started three days ago and I already can't wait to go back." 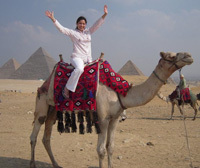 "I followed this guide precisely and in less than two weeks I have landed a job on board a major cruise line! I'm headed to Alaska, a place that I never in my wildest dreams thought I'd ever get to see. I'm so excited to begin this journey and to those of you who want to work on board a cruise ship GET THE GUIDE!!! It helped me tremendously and I know it will help you! Thanks again Derek & Liz!" "I'm so glad I purchased your cruise ship guide. About a month ago I checked my emails and there it was! 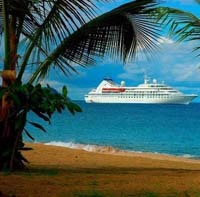 An email from Silversea Cruises saying they are interested in having me. Things couldn't look any better. 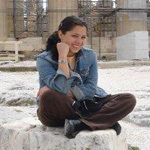 I got this awesome job and now an even better chance to travel the world." 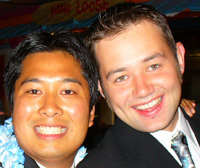 “Following your instructions made it possible for me to apply to 9 different cruise lines in less than two hours!" "I went for an interview last Tuesday in Vancouver and the next day I heard back that Cunard Cruise Lines wanted to talk with me. Four hours after my chat with Cunard, they offered me a position on the Queen Victoria as an International Host. I will board the ship in six days! Once again, thank you for everything!"